Looking back to Tempe with nice big garden beds ready for planting on both sides of the path. I finally managed to get down the Princes Highway to have a look at the newly completed Tempe Cooks River Footbridge. It is excellent. 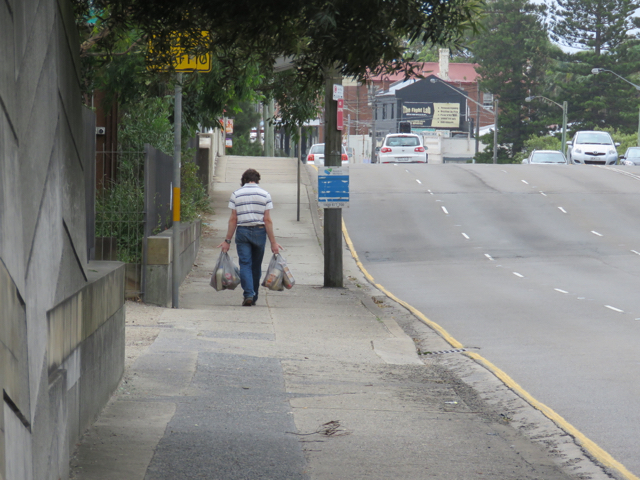 Previously, cyclists & pedestrians had to cross the Cooks River by using the footpath on the western side of the Princes Highway. The path there is not very wide & traffic comes towards you. I found it a bit nerve wracking on a bicycle. It would only take a cyclist falling into traffic or a vehicle mounting the footpath for a tragedy to happen. Thankfully, this is a thing of the past now that there is a designated pedestrian/cycle bridge over the river, which is totally separated from traffic. 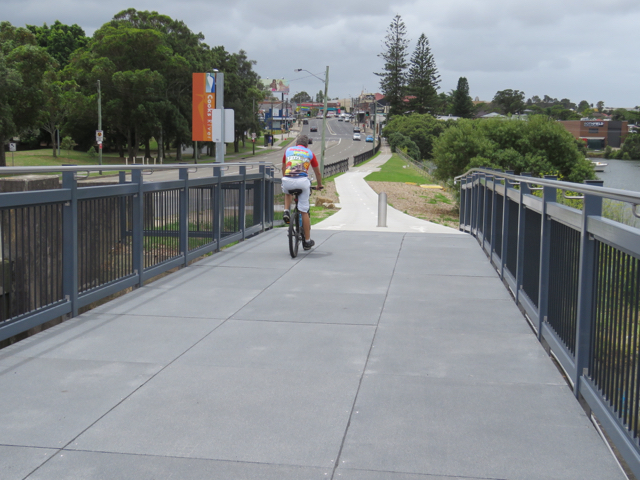 This new shared path utilises a concrete bridge that travels alongside the bridge that carries traffic over the Cooks River from Tempe to Wolli Creek. I have no idea what its purpose is, nor could I find any information about it on the internet. Perhaps it carries sewerage? If you do know, could you leave a comment please. The surface of the bridge has been covered with large panels that have a nice texture providing traction for bicycle wheels. The bridge has been fenced & fencing has also been installed alongside the Princes Highway from the traffic light at Holbeach Avenue Tempe almost all the way to the bridge. 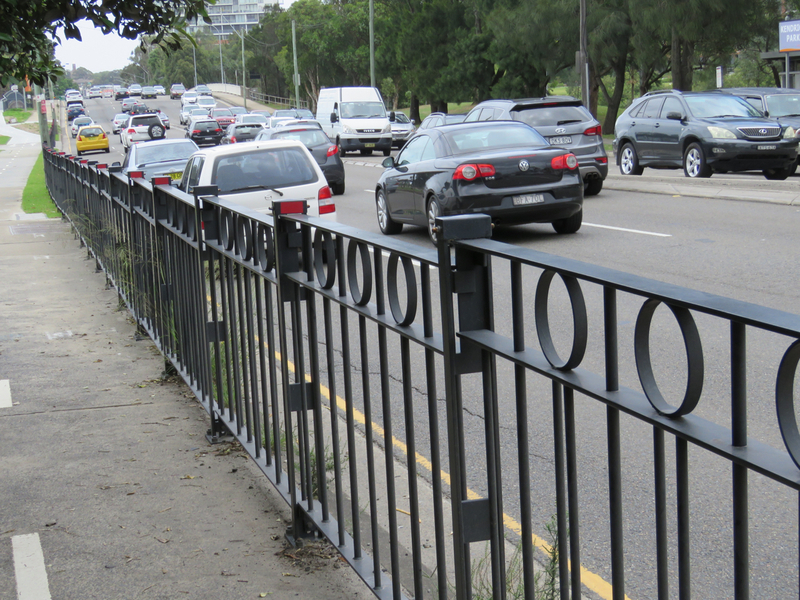 The fencing offers serious protection for both cyclists & pedestrians. The fence is substantially thick & would stop a vehicle. The path ascending & descending the bridge now incorporates artwork by Lucy Simpson called, ‘Goolay’yari (place of the pelican).’ Large pelican footprints have been engraved into the concrete path on both sides. It is lovely. “The Cooks River is called the River of the Goolay’yari, the Pelican Dreaming Story. According to the story, a man fled from battle, abandoning his wife & children, which placed them in great danger. 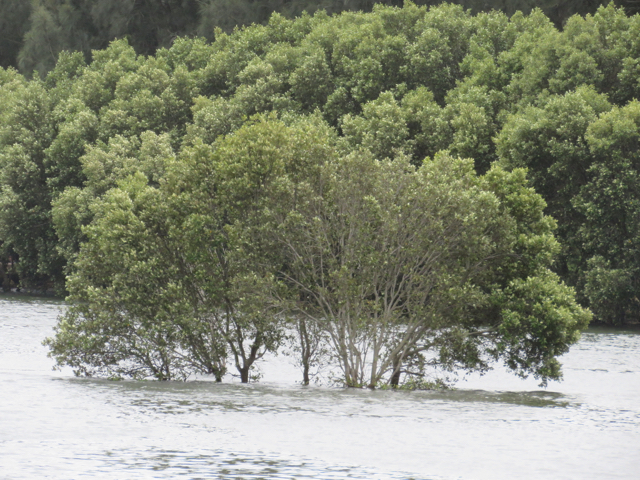 As the man fled, he stepped into the middle of the Cooks River. 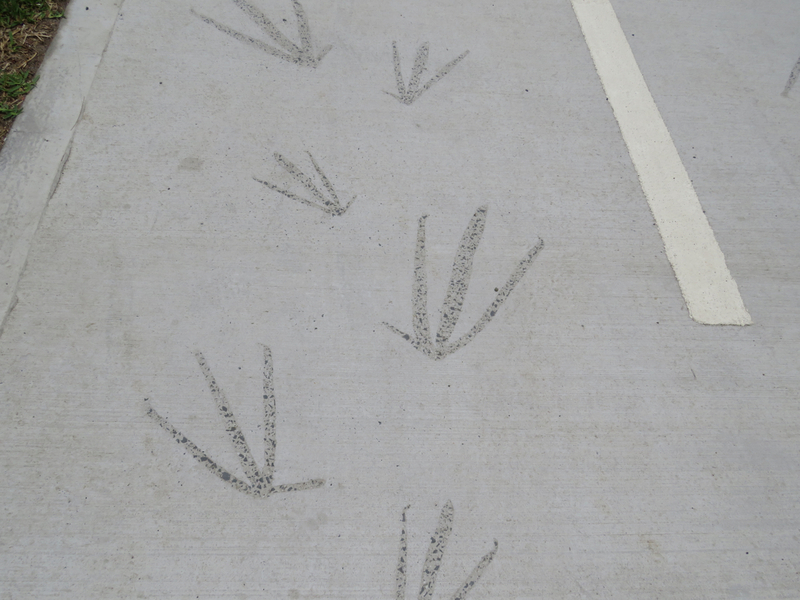 At the point where he was crossing, he looked down to discover that he had a webbed foot – that of a pelican. He had been turned into a pelican as punishment for leaving his family behind. On both side of the path at either end of the bridge are long garden beds. Once they have been planted & they grow, it will look beautiful & will enhance the view of the Cooks River for passing motorists. It is a lovely gateway to the southern end of our new municipality, which now spans from Sydney Harbour in Balmain all the way to the Cooks River at Tempe. The new bridge was active with both pedestrians & cyclists. It gives us easy access to leafy Cahill Park, which offers another view of the Cooks River from the plentiful park benches that sit on the river bank facing the river. The new bridge is a great improvement by the Inner West Council. The project cost $775,000 & was funded by Roads & Maritime Services & Inner West Council & was money well spent in my opinion. It will also make accessing the route to Botany Bay much easier & safer. Big thanks from me. The Tempe pedestrian/cycleway bridge was built by the then Electricity Commission in 1978 to carry high voltage power cables from the Sydney South Switching Station at Picnic Point to the Campbell St substation in the city. 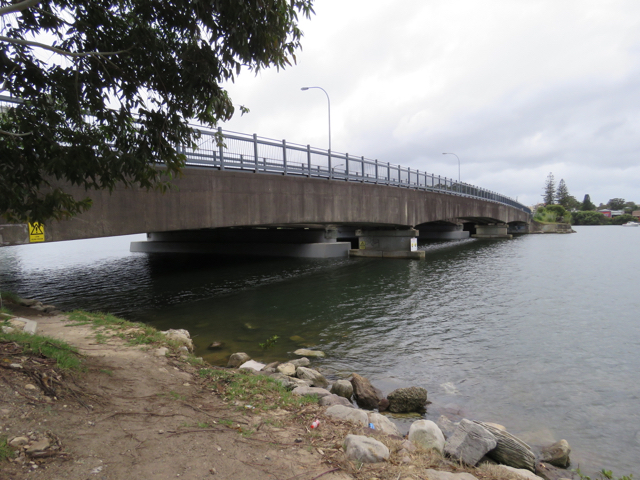 There is a similar structure beside the Salt Pan Creek Bridge in Padstow Heights, built at the same time.